This page is about the Japanese fighter Ki-44-II hei. For other uses, see Ki-44 (Family). 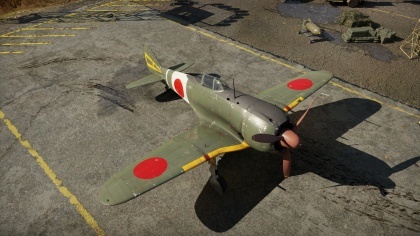 The Ki-44-II hei Shoki is a rank II Japanese fighter with a battle rating of 2.0 (AB), 2.7 (RB), and 3.0 (SB). This aircraft was introduced in Update 1.55 "Royal Armour". A very good energy fighter that turns decently and has a very high top speed when fully upgraded of 606 km/h at 6,000 m, being able to reach that height in 5 minutes at a 21-degree angle at 98% throttle. The Ki-44 will maintain a > 25 m/s climb rate with WEP below 4, 000 m. However, the engine WILL overheat on WEP very quickly below 5,500 m if manual engine control is not used. It is a phenomenally fast plane, being able to match the speed of almost anything it meets. This is coupled with excellent acceleration, energy retention, high rip speed and low control stiffening, allowing it to pursue after planes that other fighters cannot. 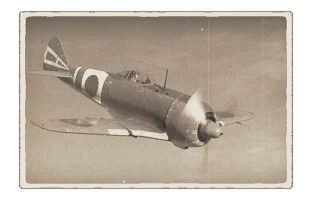 The Ki-44 retains the iconic Japanese agility of its country, being able to turn-fight most fighters it encounters, with its high roll rate serving well to keep its targets in sight and to shake off enemies. It is also equal or superior in energy fights to anything it faces, flying loops and energy trapping its foes on a whim. The Ki-44-II Hei is armed with four Ho-103 heavy machine guns, with 1,000 rounds of ammunition (250 rounds per gun). The Ho-103 machine gun has a low damage output outside of 300 meters due to the low velocity, so the player should make sure to shoot within 300 meters. However, inside of 300 meters, the Ho-103 has a decent damage output easily cutting off wings and critically damaging control surfaces, but it is still weaker than the M2 Brownings or Berezin UB machine guns. The accuracy is very good overall as two of them are in the nose & the other two are in the wings. The best belts for the Ho-103 machine guns would be either Stealth or Air target belts depending on play style. Ingame, the Ki-44 is the pinnacle of point interceptors at its battle rating. At the beginning of any match, use your amazing climb rate to get as high as you can. If you climb at around a 22° angle, you should be able to find yourself far above enemy bombers by the time you encounter them. If there are bombers, those 4 x 12.7s machine guns can do a number on a bomber, but the bombers defences can also do a lot to you. When attacking a bomber, do it in high-speed passes, giving the gunners minimal time to lock on to you. Aim for the wings of the bomber as, while not exactly high velocity, your shells can do a lot of damage to a bomber's wing. If there are no bombers your next job is fighter interception. Attack enemy fighters using Boom & Zoom tactics to destroy fighters. Use vertical maneuvers to maximize your energy retention while booming and zooming. As long as you keep your speed up, you should be fine. Horizontal maneuvers are not highly recommended as it performs worse than in the vertical but will turn with most other fighters if needed especially with flaps. Stall climbs can also be used to great effect against opposing planes due to the incredible energy retention and climb rate. This page was last edited on 3 April 2019, at 03:54.